What will be the possible technology behind the Mark of the Beast? Bill Salus: Concerning another interesting technology, 2,000 years ago the Apostle John wrote in Revelation 13 about a cashless society that would come forth in the last days. He said that there will be a point during that time when the False Prophet and the Antichrist will put together a cashless system because he reveals in Revelation 13:16-18, "He also forced everyone, small and great, rich and poor, free and slave, to receive a mark on his right hand or on his forehead, so that no one could buy or sell unless he had the mark, which is the name of the beast or the number of his name. This calls for wisdom. If anyone has insight, let him calculate the number of the beast, for it is man's number. His number is 666." Now, of course, mostly everybody has heard about 666, although they don't understand what it is related to. From these verses we know 666 has something to do with this prophecy concerning a cashless society. Almost 2,000 years ago, John trafficked in monetary currencies of denarius, right? But, here he is talking about money that you know you can't transfer such as a denarius. You can't put a denarius inside of your hand or in your forehead. John is talking about something entirely different. He's talking about a mode of currency and monetary exchange that is apparently cashless. Mark Hitchcock wrote a book about this recently called Cashless. Do you think John was possible trying to describe a technology that could facilitate a cashless society, and would that technology potentially be biometric which we currently have at this point in time? Nathan Jones: You can certainly control a person by their money. There is no doubt, no doubt, that we are moving towards a cashless society. I barely use cash myself. I use credit cards for everything and then pay them back each month via electronic transfer. Right now there is a big push to have something that you can swipe that can't be stolen. Maybe it will be implanted in you. There are even reports where certain stores have been testing this cardless system out to just see how it works. So, we are moving into that direction, and I agree it is a smart move. After all, I don't want thieves stealing my credit cards and my identity. I don't want crooks stealing my wallet. If there is something built into me that I can wave or is biometric that scans my fingerprints or something like that, that that would be a great thing. It would all have to be managed by a large database with lots of connectivity and networking, so there is definitely a huge technological component there. I won't be the first to say that the Mark of the Beast will be an RFID chip or that we are all going to be running around with chips even before the Rapture. There are a lot of people panicking out there who believe that if the serial number on their computer chip or if a barcode on their Cracker Jacks has a 666 somewhere they'll declare, "Oh, no, I can't buy this product." I once wrote an article about this hysteria called Stop Panicking Over the Mark of the Beast. There is just no way during the Church Age that we have to worry about taking the Mark. It is something that the Antichrist institutes at the mid-point of the Tribulation, and since the Tribulation is clearly not going on right now, we don't have to worry about taking it. John was pretty specific in his description of what he saw concerning the Mark. For one, we are talking about a First Century man who actually could see the Mark ON the forehead and the right hand. John was not talking about it being IN the forehead or the hand. He could see it as plain as the nose on your face. So, unless it causes a big bump which would be pretty obvious, it's not implanted. These little RFID chips that have come out are encased in sliver thin glass to protect the component inside. So, I don't think they will be visible as they aren't even visible now. We put them in animals and we don't see them on the animal, right? I believe the Mark will be a tattoo or something etched onto our skin. Maybe it could incorporate magnetic inking so it could be scanned. Customers during the Tribulation will walk into a store, and unless the clerk sees the Mark, they know not to sell them something or they'd probably be killed themselves by the Antichrist for helping those who haven't declared their loyalty to him. While I believe there is probably technology behind the Mark, I lean more on the side that it won't be a RDIF chip. Bill Salus: Those types of technologies if this is what John was trying to describe are in themselves not necessarily a bad thing. Nathan Jones: Not at all. Bill Salus: Like, for example, when you put a chip inside of your poodle's neck and if Fifi gets lost, you can use their GPS to find them. Or, let's say little Johnny gets kidnapped, you could find him if he had some tracking mechanism. You know that even your cell phones tend to have a ping that they generate so you can find someone. Our smart phones actually have these RFID-like locator chips where you can locate them through GPS. So, the technology in itself is not a bad thing. The usage of tracking chips to monitor all of humanity like as you said with a large database is when technology can be used for evil. The Antichrist bids to be omnipresent, which he can't be because only God is, and he can't search the hearts and minds or men and women. But, to appear omnipresent, he will be able to track people's every footstep if they have a technology inserted that he can monitor through GPS or things like that. But, like you said, the Church won't be here for that. We will be raptured prior to this, so it is not a threat to us. The Mark is more then just a technology, it is a form of worship? Nathan Jones: Yes, it is a loyalty mark. Bill Salus: The Mark will be a loyalty thing, as well as it also facilitates people's ability to buy and sell. 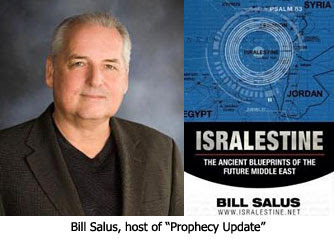 In the final segment of this interview with Bill Salus concerning Bible prophecy and technology, we'll look at the eventual decline of technology in the last days. The mark does not necessarily mean a cashless society nor does it have to be a tracking device nor be able to be scanned. It can simply be a visible mark that requires no technology at all. Billy said... "The mark does not necessarily mean a cashless society..."
That 'assumption' is true on it's face, but the facts of history clearly show that it will be cashless! This has been carefully mapped out and orchestrated for a long, long time! "Indeed, The foundations for the EU and ultimately the Euro single currency were laid by the secretive Bilderberg Group in the mid-1950’s. Bilderberg’s own leaked documents prove that the agenda to create a European common market and a single currency was formulated by Bilderberg in 1955." I know you read this before 'cause you asked the question and posted before and after it. And this can no longer be called "conspiracy theory" as it is all now "open agenda" that Soros, Rockefeller, and many others have written and spoken of where they are taking us! Actually the implant technology fulfils the scripture which says you cannot buy or sell without the mark. If we have a cashless or cardless society and individuals carry their own bar code within their bodies (which will include the balance of their bank accounts) trading can happen simply by having your forehead or hand swiped. If you do not have that mark it will be impossible for you to buy or sell because it is only through the implant, within you, that transactions can be recorded. Be careful. The scriptures tell us to shun every appearance of evil. Do not take any mark or implant upon your hand or forehead. Better to be safe than eternally sorry. It is true that the eventual mark will include giving allegiance or solemn oath to the antichrist. A time will come when the ac will enforce everybody to take the mark or be killed. What we are seeing now is the availability of the technology he may use, which means the time is close upon us. Best not to have the implant (at all) because we know where it is leading and belongs to that evil system therefore it would be wrong to attach ourselves, now, to it. "He who becomes a friend of the world becomes God's enemy" (Book of James). 666 - VeriChip, Somark And Microsoft Unmasked! ... An expos on the FDA's approval of VeriChip, the Microsoft connection and Somark's RFID invisible ink. I hope you are speaking forward to those who will be "Left Behind", 'cause we're not planning on being here for that stuff. I firmly believe that we will be raptured before the allegiance to the ac takes place and the dishing out of his mark. However, because technology points in that direction, we can see that things like verichip etc are leading up to its useage during the G Tribulation. Therefore, I believe we should not be party to assisting in its future use by using the prototypes now. In fact by using it, it could indicate that we are actually not born-again because we are showing that the attractions of the World system are far more endearing to us than our Lord and Saviour. The earlier point I am making is that there WILL be technology during the Tribulation and the electronic implant will be necessary to enable a cardless and cashless society (after the rapture). My name "reject the mark" is aimed at those who are left behind. I did not realize that tats could have RFID properties. Scary! I do not think that the mark will be invisible. I think the beast will want all to see the loyalty of the lost souls. And the future could be cashless or may not. Not taking a stand on that one. The reason I believe that the mark will be electronic is because the ac will want to use the "Big Brother" technolgy to keep tabs on every single person. How can he have the power and authority to rule the world without the Big Brother technology? By using the electronicn implants he will have all the information he needs, to control everybody. Surely, a simple tattoo (ac seal) will not enable him to have that control? RTM, I would tend to agree with that line of reasoning. These implants also will have GPS capabilities, that way if you are out of range of a reader, they can still verify your location. I also believe they will be linked to our biological system, at the point of death or dismemberment of the right hand or head, the chip or micro processor will cease functioning. At my work, I have noticed that everything is going paperless, invoices, pay stubs, trucking logs, everyone is required to have direct deposit for payroll.